Many Politico stories can be aptly described as meretricious. They promise revelation and insight; they deliver commonplaces and common wisdom, presented in breathless, can-you-believe-this tones. But this Politico piece on overall strategy for the Obama reelection effort seems both solid and interesting to me. It also acknowledges a reality that I’ve been throwing in the faces of friends for many months now: Yes, Obama will have a tough reelection fight, given the economic situation of the country. But incumbent presidents have enormous natural advantages — in fundraising, organization and visibility — and this president also has a seasoned and inventive political team. That team surprised the world in 2008, and 2012 will not be a simple reprise of that campaign. The Obama team will look to surprise again next year, and this Politico article looks at one way such a surprise might go — an expansion of states put in play. Republicans tut-tut such a strategy, but the common wisdom in late 2007 and early 2008 was that a black man couldn’t win the White House, and Obama should wait his turn, and Hillary had a lock on the nomination. The economy will not be great in 2012, but presidents have a lot of levers to pull when they want a better economy in an election year (look back to Nixon ’72, if you don’t believe me). The economy will be significantly better then than it is now, and it is likelier than not that Obama will win reelection. 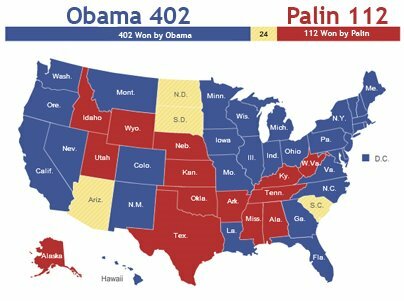 And if the economy does improve, and the Republicans don’t nominate someone more substantial and believable than Mitt Romney, there is a real chance that Barack Obama will win reelection by a margin that approaches landslide. When he does, remember that you read it here in June of 2011.